Do you have a party or special event coming up? Leave the job to us. 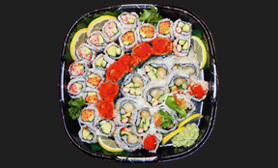 Mac’s Sushi offers a variety of platters and group plates perfect for your special occasion. 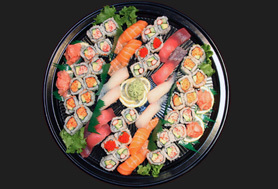 Our beautiful and delectable sushi will delight your guests and help make your event a memorable one. Our Chefs Like to Party Too! 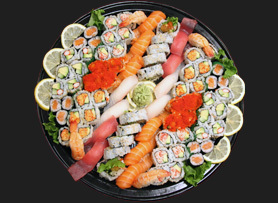 For larger private events and special occasions, have one of our Master Sushi Chefs come out and cater the affair right from your venue. 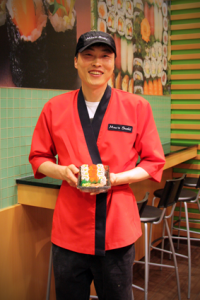 Our master sushi chefs will make your jaw drop and your mouth water as they perform for you and your guests. You’ll be amazed by their culinary expertise – creating beautiful and mouthwatering sushi before your eyes. Live sushi preparation is not only fun and entertaining, but a delicious attraction for your guests. A minimum of 500 sushi pieces must be ordered for an on-site chef. Click here to send us your contact information so we can provide you with details on having a chef at your catered event. Platter items may differ if ordered at store. To get exact items/pricing below, place order through website. 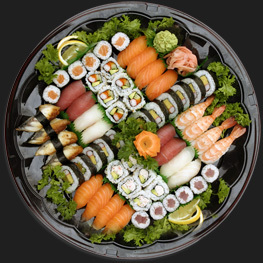 To learn more about the ingredients for each type of sushi, click here to visit our Menu page. Would you like to place a custom order? Custom orders will be quoted individually. At Mac’s Sushi, we understand the needs of customers with allergies. If allergies are a concern for you, please contact us with any questions about Mac’s food. 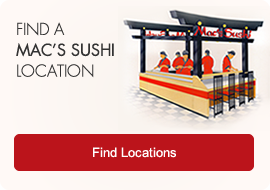 Mac’s Sushi – Fresh Daily!